Well it seems that this year the birds couldn't resist visiting the bistro even though it was the RSPB bird count. Most of the usual clientele turned up and some unexpected ones. Starlings often have a bad press - they're not the most polite diners but their dinner jackets glow in the sunshine! The feathers seem to change colour depending on how the light catches them - this is called iridescence. Apparently the word comes from the Greek word for rainbow. If you look below at the starling's breast feather you can see why! The starlings make short work of the fatty coconuts and often a bit of a squabble ensues. 4 blackbirds - they eyed one another up but seemed to tolerate each other's presence which won't last. 8 starlings -they've even learned how to cling to the feeders even though with feet like theirs they shouldn't be able to. 12 sparrows - probably more than this really but they are not easy to count especially scattered all over the garden and constantly on the move! 1 robin - cheekily looking in through the window at us. 1 bullfinch - a female delicately pecking at the mahonia flowers - she didn't devastate them so I wondered whether she was looking for nectar - hope she and her mate don't find our peach blossom - if we have any this year that is. 1 sparrowhawk which looped under our magnolia tree at top speed and fortunately for the other birds missed catching a meal - it did manage to put an end to our counting though! I've just noticed in our front garden bed that that our very first crocus is open and another is on its way so I just had to post a quickie. 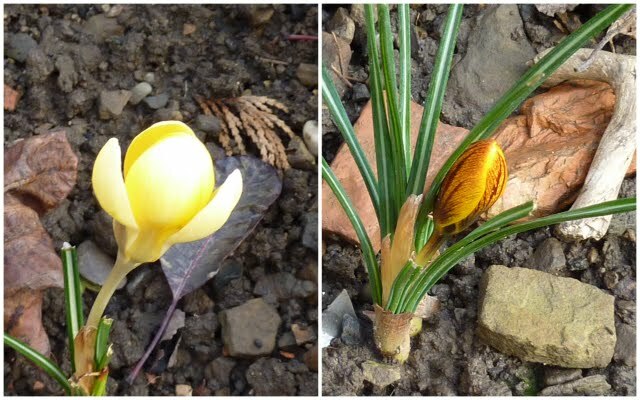 The crocuses (croci - which is it?) are from a mixed species pack that I planted last year so it's their first appearance. I know the one that is open is Cream Beauty as we have some of those elsewhere in the garden. Thanks to Mark's post I think the other must be Gipsy Girl. Not brilliant photos as I couldn't get near enough due to muddy soil by I just wanted to mark the occasion! There are a couple of things coming up that you may be interested in joining in with. 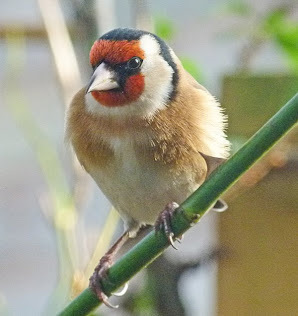 The first is this weekend's Big Garden Bird Watch. 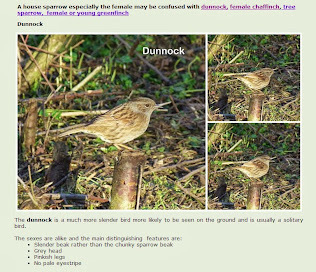 This is hosted by the RSPB every year and we have taken part for quite a few years now. Our birds seem to know that it is going on and as a result keep their heads down and mutter "You're not counting mean" I'd say twitter but nowadays that conjures up a completely different idea. I think the general bird brain idea is that if we don't count many we'll all worry that numbers are falling and we'll put them on a at danger list and pop out far more food. Clever things these birds. We had a female bull finch eyeing up out new mahonia flowers yesterday but I doubt that she'll show her beak this weekend! I know that you are thinking it's our imagination but why do the feeders not go down as quickly? It isn't that we are more in evidence, we just watch from the same place as we always do - inside the house. By the way if you live in the USA they have a bird counting event too which this year is February 17 - 20. I guess other countries also have something similar. It's already been going on for a few days but there's still time to have a go. I know of some schools who take part every year. When the results had to be emailed in I know of one headteachers who used to complain that his school's email filtering made it fairly difficult to send in his information and had to resort to listing blue thingies and great thingies to get round it! If you do work with children or are a parent of a primary age child you may also be interested in a competition being launched by Spotty Green Frog a company that supply primary schools with amongst other things starter kits of gardening tools. They are offering £100 prize to spend on equipment for schools - visit my School Vegetable Patch blog to read more. You don't have to enter as a school, children can enter as individuals too with a prize for the winning child as well as the prize for the school. ... and now for the good news. After what was a brilliant harvest last year our apples just have exceeded expectation! 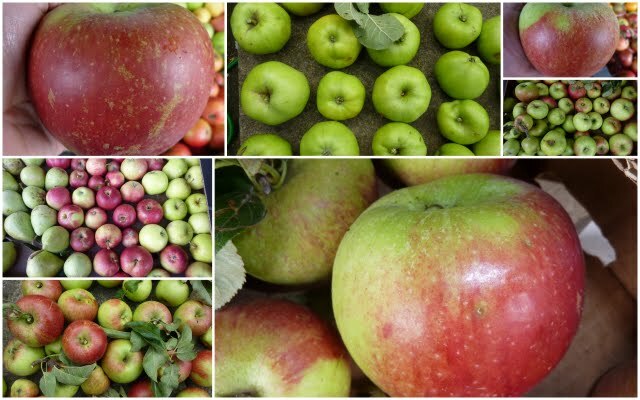 We picked lots of apples last year some eaten fresh from the tree - and it doesn't get better than that! 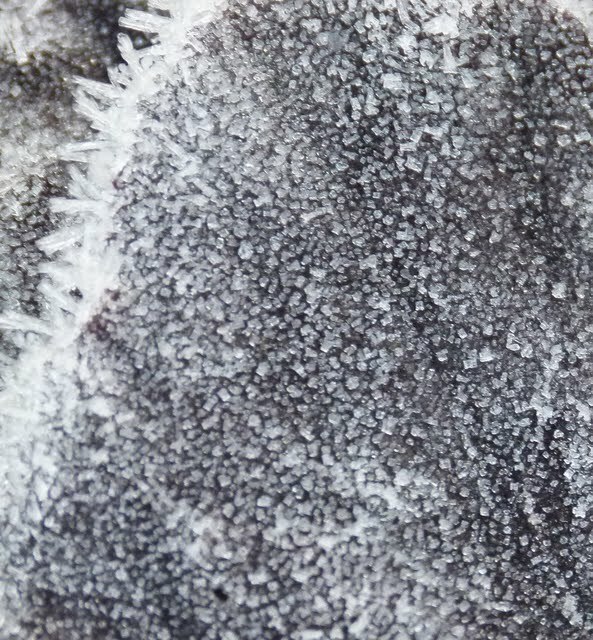 Some were blemished and so were either used up as soon as possible or stewed (some with blackberries) and popped in the freezer for use in pies, tarts and to accompany yoghurt or porridge throughout the rest of the year. We don't have enough freezer space to store all our apples in this way and no space for more freezer space either. It's also good to have some unfrozen apples for cooking and eating. The problem is that each year we have wasted apples as the skins have dried out and gone wrinkly as many things do as they get older! Anyway I'd read somewhere - can't remember where - that the best place to store apples was in the fridge. Now we just happen to have an old fridge freezer - the freezer part being full but the fridge part having plenty of space so we popped as many apples as we could into the salad drawers. We didn't do anything special like wrapping each apple in paper - we literally just piled them into the drawers. Once the drawers were full we were left with the largest and best apples which we gave a little more attention - we did wrap these individually in paper, just to hedge our bets - and then they were spread out on the wire shelves. And it has really worked! 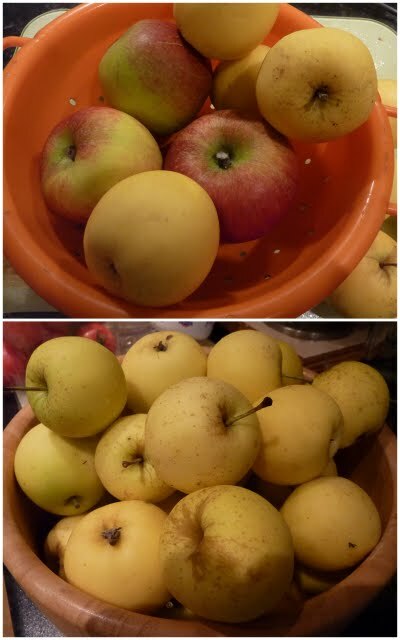 We are still using the apples and there is no sign of rotting or shrivelling up. In case you are wondering the dark mark on the apple at the front is a shadow and not a bruise! The only thing is some of the skins have gone a bit tough so some apples to be eaten fresh (well fresh from the fridge) have to be peeled. No hardship as they still taste better than many of the ones available in the supermarket. We had a 'fresh' Egremont Russet apple today and it was perfect no tough skin and really sweet and juicy! There's good news and bad news in store! Let's deal with the bad news first ... After what was a brilliant harvest last year our onions just haven't lived up to expectation! Again I discarded any bulbs that hadn't seemed to dry off properly and looked as though they may rot off in storage. I say discarded but any that were usable were used up rather than storing them. 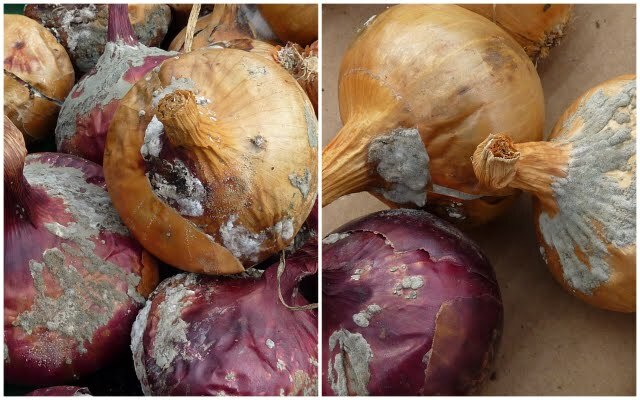 But all my efforts have been in vain - we have constantly been throwing away onions that have started to rot - the race has been to use them before they went bad. Even some that looked perfect showed their true colours when cut into - and often that true colour was brown! Don't get me wrong we have had enough onions for us and my sister to use up until now, and maybe a little longer, but it's been disappointing to see them developing mould. So what has gone wrong? 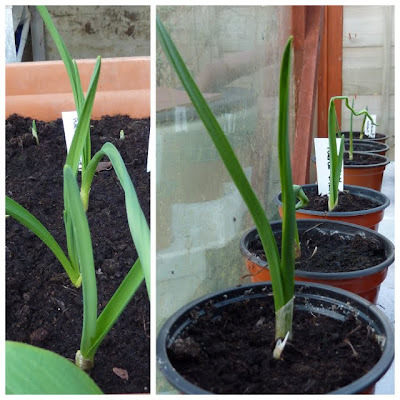 - Maybe we were wrong to take them in before they had dried off properly but after the long dry season it was set to be wet so we gathered them and popped them on the greenhouse floor to dry. They seemed to dry OK but maybe they didn't cure properly. And maybe the conditions in the greenhouse were too damp to store over winter but if so where can we store them next year? - We haven't room anywhere else. 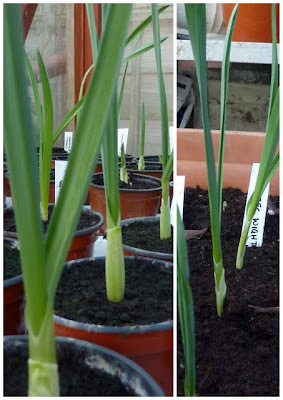 We don't seem to be the only ones who have suffered though and other sufferers haven't lifted their onions too early. Browsing the Internet - as you do when things go wrong - one tip I picked up is to cut off the tops of the onions 3 - 5cm from the bulb (trouble was it didn't say when - is it whist the tops are still green?) and turn the bulbs root plate facing upwards onto wire netting. This should be done under cover such as inside a greenhouse so any moisture drains. It said the bulbs should be given as much warmth as possible but that can't be right can it - wouldn't they cook?. Apparently it helps to blow cool air under the netting for a week or two if the weather is damp. The idea is to dry the tops as quickly as possible. Interestingly, last week, I had a surreptitious squeeze of a supermarket onion and the top was slightly soft. Just like the onions go when they are starting to rot. So maybe the problem was the season turning damp just when the onions needed to have it dry! Maybe it wasn't our fault after all! 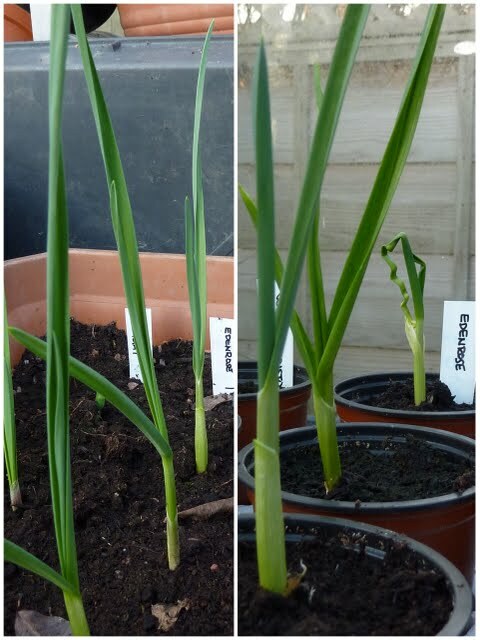 And to crown it all - some of our perfect onions have been nibbled by mice! I'm on the look-out for any mice with oniony breath. If I catch you mouse - watch out! I was going to give you the good news now but I think I've gone on long enough - be patient and I'll give the good news in my next post! I bet they wished they'd kept their heads down. 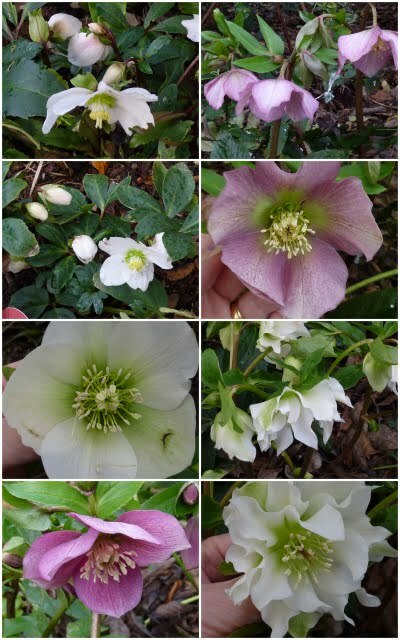 These hellebores are the first ones on flower in the garden - although one has flowered since about November - still lots more to start flowering. Below the bulbs are pushing through but why do the tulip leaves always get nibbled? 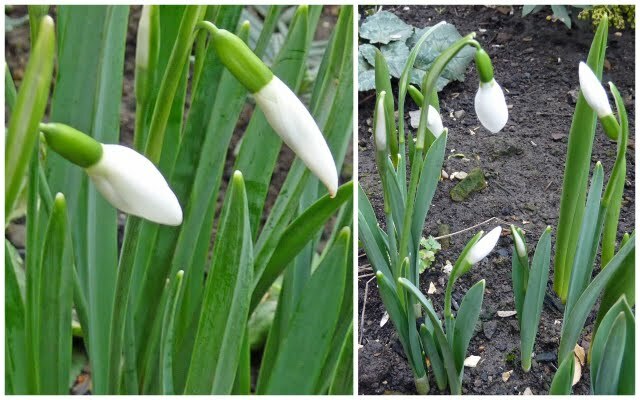 The ones below were photographed in my sister's garden which is very sheltered - ours are just showing the first signs of the white buds but as last year I was about the last to post a snowdrop photo I decided to cheat a little. Camellia in bud again in my sister's garden - we were quite excited to see this as it's the first time it has flowered - other than when we first bought it several years ago. We have a couple of camellias in our garden one of which I'm afraid was subjected to Martyn's pruning tools. It had become immense and so he was fairly brutal - I am hoping some of it survives but they'll be no flowers this year either way. 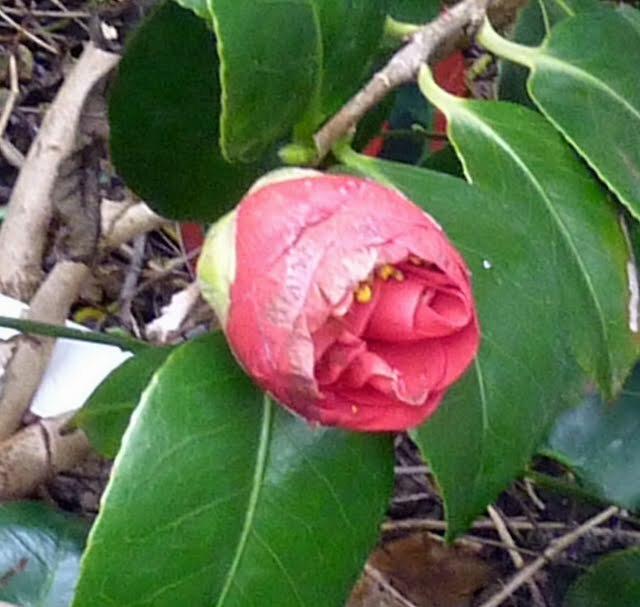 Another camellia is becoming too large for its allocated spot. Just wondered has anyone ever moved a fairly mature camellia? 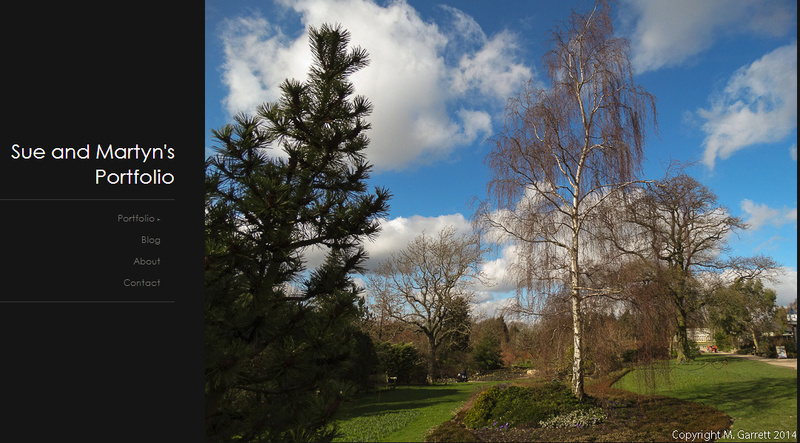 The photo above was taken last year - the problem is that if it gets and larger we won't be able to walk past it. 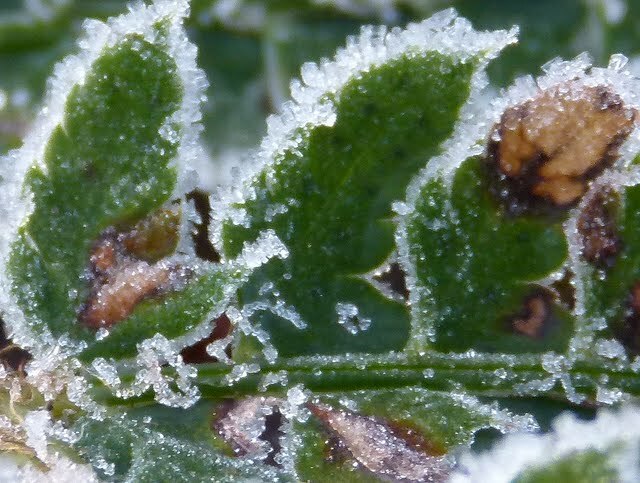 Spurred on by Mark and Jenni, and the fact that we had our first real frost overnight, I thought I should try and get up close and personal with some plants in the garden. 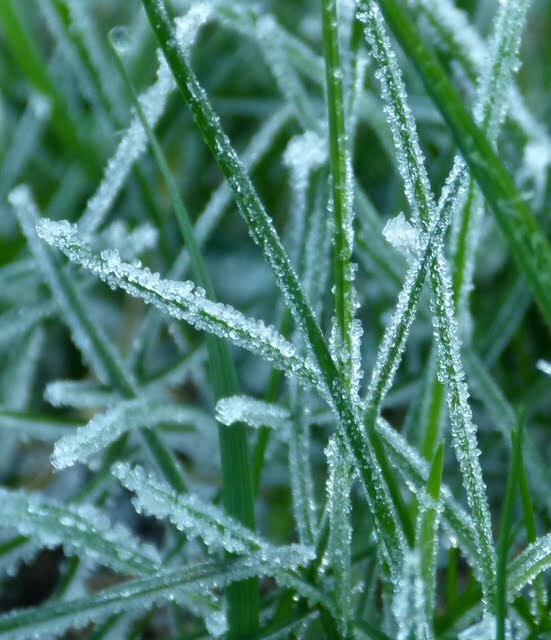 Lawn - grass has kept on growing! 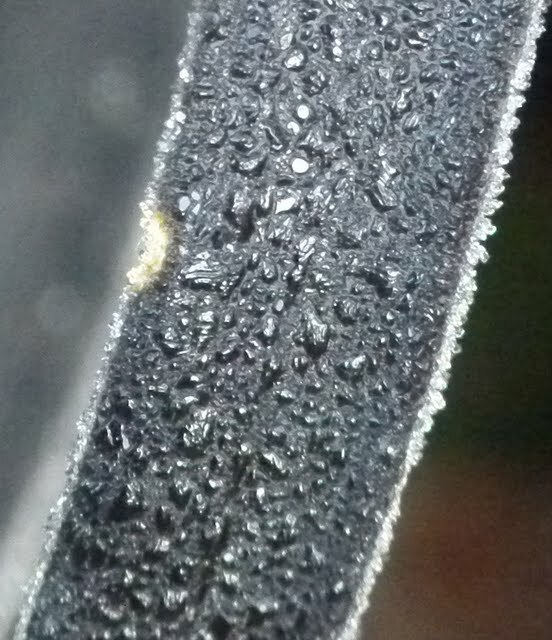 To be honest I'm a bit disappointed as the photos aren't as sharp as I wanted but I decided to show them anyway - warts and all. 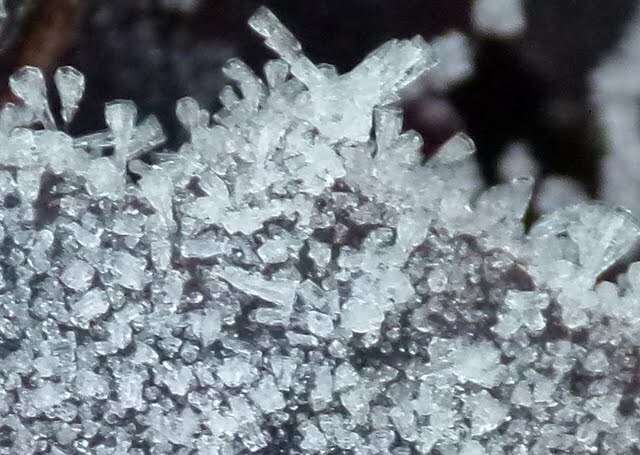 I found the structure of the ice crystals fascinating. Maybe I should try using a tripod - do you Mark, Jenni? The trouble is it was a bit cold to be staying still for long. Any tips will be appreciated. Not close-up really but just because I like it! 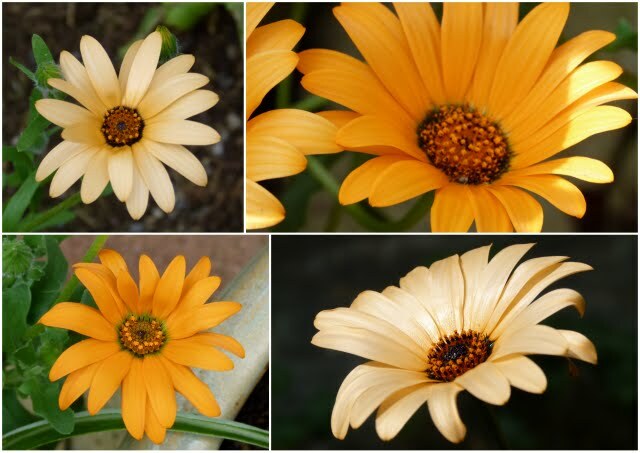 It's not only vegetable seeds that we have been pondering over as we sow quite a few flower seeds too. Some flower plants raised end up on the plot and others in the garden and some even end up in both. Not the same actual plant of course! I'm hoping for a better flower year this year as many of our annual sowings didn't thrive due to the extremely dry conditions - when it came to watering the food crops had to take priority. We have grown sweet peas for ages - it is a flower that just seems to 'go' with the idea of allotments. This year I'm going to try growing more than usual to go for the wow effect! As far as I'm concerned a sweet pea has to have perfume so I'm sticking with the varieties grown last year (Kings - Perfume Delight and Spencer Mixed) - and adding Sweet Dreams from T&M. I ordered some low growing sweet peas - Snoopea last year but they were substituted with a tall growing variety (not a good substitute when size mattered) so I'm trying to get some seed again this year. I usually grow some French marigolds and tagetes along the edges of the fruit tree beds. Last year I was amazed to find lots of French marigolds had self -seeded even after last winter. Amazed as they are supposed to be only half hardy and in theory shouldn't have survived but survive they did and lots of them. Obviously they didn't spring up in the places that I want so I just transplanted them. This got me thinking - usually the marigolds take quite a lot of space in the greenhouse so this year I am toying with the idea of trying to raise them in a seed bed on the plot - maybe under some sort of cloche if necessary - what do you think? Another addition to my flower list are antirrhinums. I did once try growing these but the germination was poor - I've since learned that they need sowing in a John Innes type compost but the early failure put me off. Then last year some self sown plants popped up in our front garden bed and looked good there so I'm, going to have another try and use them to fill gaps between perennials. I've chosen Snap Happy from Kings which shouldn't grow too tall. Dahlias are another common allotment flower. I grew some from seed last year, they were quite slow to grow into decent sized plants and the flowers were a bit of a disappointment - lovely colour range but the flower shapes were a bit ragged. I guess this again could have been the conditions - anyway we have saved the tubers and will plant them to give them another chance but I've ordered a packet of a variety called Pompone to add to them. As the name suggests this is a pompom type which I like for cut flowers. I also tried growing Osteospernum from seed last year - I chose a cheap variety as I wasn't sure how easy they were to grow so I wanted plenty of seed. They were fairly easy so this year I'm trying a different more expensive variety. The ones I planted last year were oranges and yellows so this year I'm going for the purples and whites of a variety called Passion Mixed. The colours are more in keeping with what I expect from osteospernums. I've still lots of last year's seed left so will grow some of them too - there are only 8 seeds of the more expensive variety. We like to have pansies in tubs for a bit of winter early spring colour and usually I have bought these as plants. This year I'm going to try growing my own from seed and have ordered a couple of varieties - I just hope that they don't all end up the same colour! 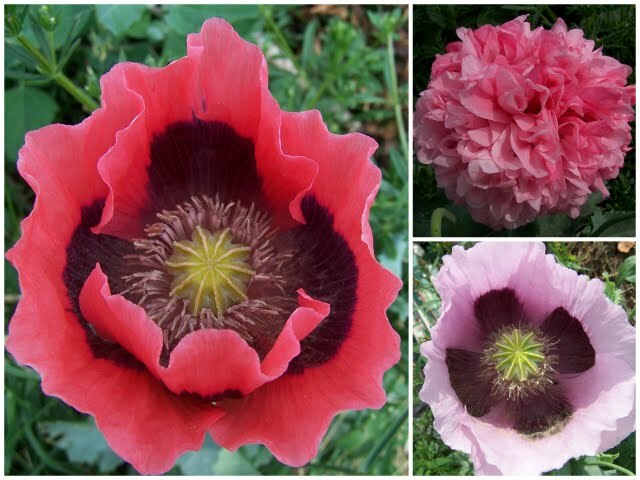 I'm also trying to grow a perennial poppy Fruit Punch - We always get a massive amount of annual poppies coming up all over the plot from goodness knows where - we've haven't planted them! What's the betting that the ones that I try to grow are less eager to please? On plant I didn't order but it looks as though I'm going to end up growing is nemophila - Total eclipse. It was a free packet from Plants of Distinction. It sounds as though it's habit is similar to that of limnanthes - poached egg plants so it will be one for the plot. We started off with just six limnanthes plants and now just look . It tool the above photo last week - the limnanthes form a dense carpet under the roses but fortunately do no harm. They look great when the are flowering and can even be spotted in an aerial photo. If you're interested in the full list of my flower choices it's here. Now this post will either interest or bore you silly. 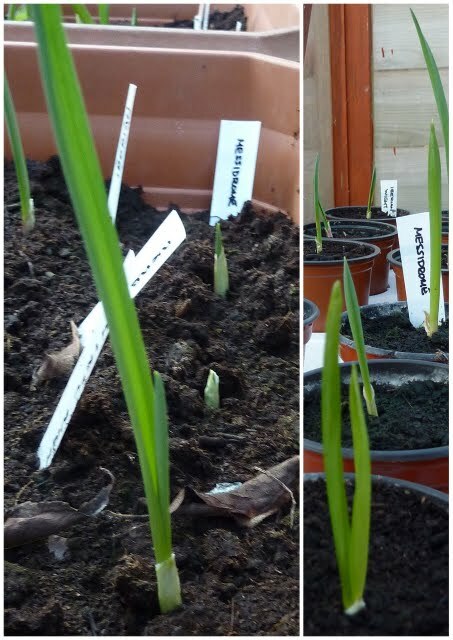 If it is the latter I'm sorry - I'll try not to write too many garlic update posts - honestly I will try! The garlic is continuing to grow well in the greenhouse and is needing very little watering as with the damp conditions the compost is remaining moist enough. On the plot the garlic planted directly in the soil is basically standing in mud so it will be interesting to see how it copes! Now you have my permission to sign out as here follows a variety by variety update. 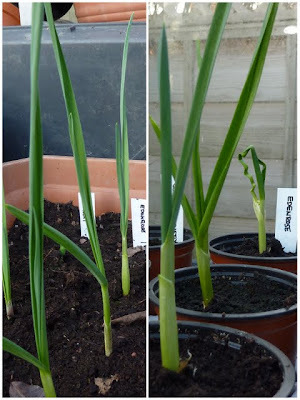 Edenrose is only slightly behind the two leaders due to one of the cloves planted in a small pot displaying twisted growth. It is also growing well on the plot but again some shoots are twisted. Close behind is Early Purple Wight - again the cloves in the tub are growing well but in the small pots two of the cloves are showing twisted growth. It's also growing well on the plot. 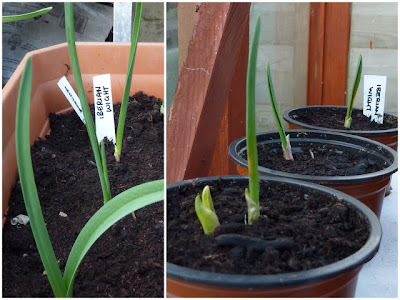 Next comes Iberian Wight - all the cloves in the tub are growing well and although making slower progress all the clove is the small pots are also growing. 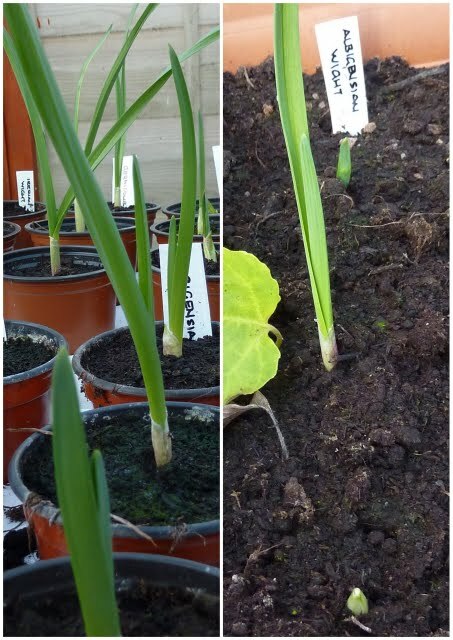 One clove seems to have developed two shoots and it was definitely a single clove that I planted. It is slower on the plot though. 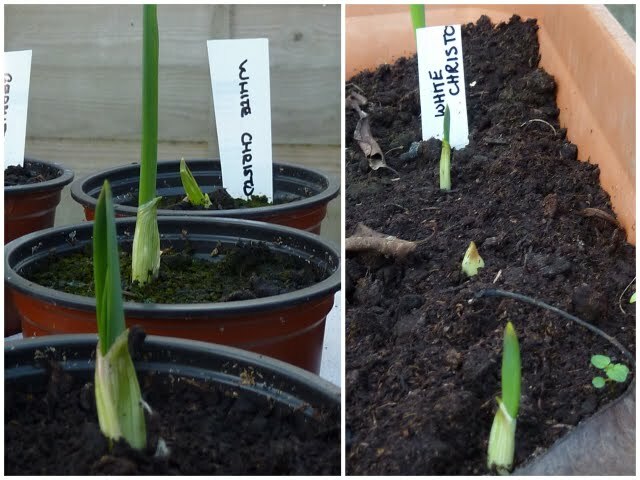 The Messidrome cloves growing in the pots are at a similar stage to the variety above as are the cloves growing in the large tub. On the plot I almost missed the one clove that is sprouting as I mistook it for a blade of grass. 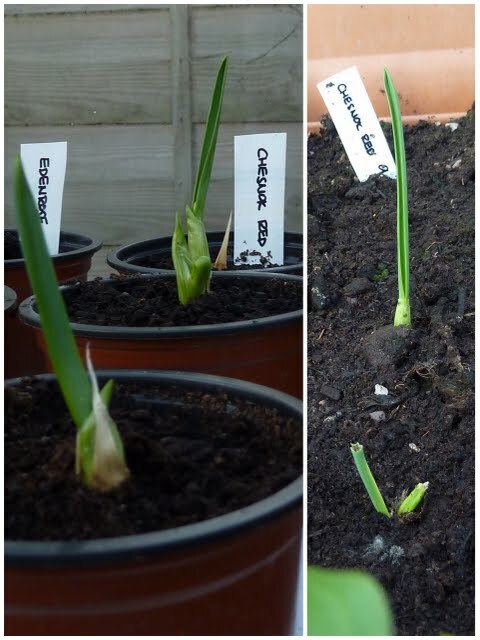 Chesnok Red comes next - al the cloves are growing and are all at a similar stage - although I think one shoot in the tub has been nibbled or broken in some way and one of the cloves in the small pot looks as though it is going to grow twisted. On the plot just small shoots. At a similar stage is Wight Christo (excuse the misspelling on the label but I always have to stop myself from writing White instead on Wight and this time I failed). 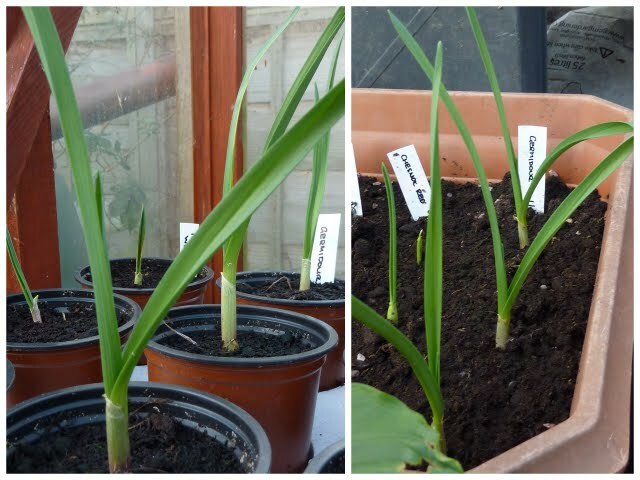 Again all the cloves are growing although one of the ones in the tub is only just starting. Wight Christo is about the same stage on the plot. 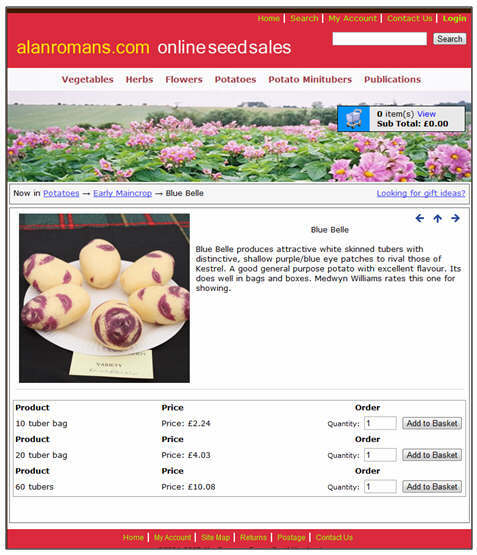 We order our seed potatoes from Alan Romans and have done for a few years now. 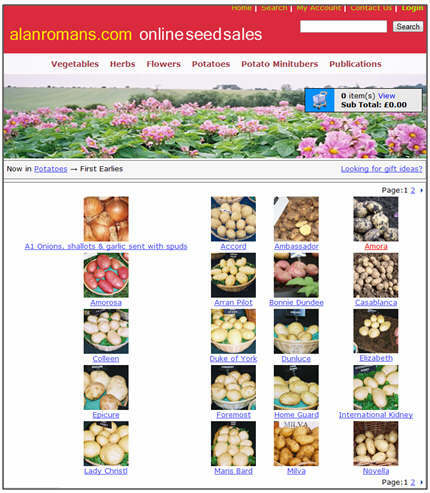 Even if you don't want to buy your seed potatoes form here the website is worth a browse. He offers over 120 different varieties of potatoes and this year he has started selling seed potatoes by the number of tubers in a bag (10, 20 or 60) which is really useful when trying to decide how many to buy. Also there is a page for each variety with information and cooking properties which certainly helps make an informed choice. The downside is that potatoes are heavy so post and packaging does add a considerable amount to the cost £7.30 for up to 24kg. If you only want a few tubers then it does make them expensive but if you join up with a friend like we do it does cut the cost. So which varieties have we chosen? We always have a range of varieties as this way whether it is too hot, dry, cold or wet something usually comes through for us. This year despite the really dry conditions and hardly any top growth out potatoes produced a really remarkable crop. We are more or less sticking to the same varieties but as always adding some newbies. Two all time favourites Charlotte (second early) & Nicola (early maincrop). Juliette (early maincrop) which we have grown most years but not last year. We tried Winston (first early) for the first time last year and it performed well both in bags and outside so shall get the same treatment again. As usual we only grow early varieties as then if blight strikes the tubers have usually still put on enough growth to produce a decent crop. That's what has happened in the past but this year - well who know? A welcome sight - in more ways than one!